1) Originating from USA, one of the earliest Doom bands around, having been around in one form or another since the early 70s, it's safe to say that Pentagram had a big impact on Sabbath inspired Doom-metal that was to follow over the next decade. The band also strongly intertwines with the band Bedemon and is sometimes seen as one and the same. 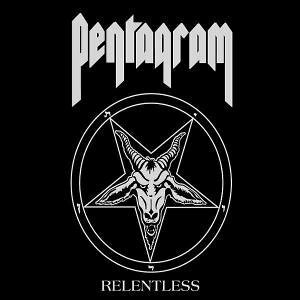 Pentagram are considered to be one of the all time classics by many older fans for understandable reasons. Their music can perhaps best be described as "proto-Doom" with a strong resemblance to the first Black Sabbath releases. The unique vocals of Bobby Leibling make sure they have a very unique sound. The first 7" was released under the name Macabre - guitarist Victor Griffin now has a new band called Place of Skulls. - the 1974 7" ep was never officially released and was only released in 100 copies on a test pressing. 2) Pentagram (internationally known as Mezarkabul) is one of the most famous and spectacular heavy metal bands in Turkey. Their first album, the self titled "Pentagram" was released in 1990 and consisted of speed/thrash metal songs. Murat Net, who would later be replaced by Demir Demirkan, played lead guitar for their first record. Two years later, the band released their second album, "Trail Blazer", and for the first time gained the attention of heavy metal authorities in the world. Especially Ogün Sanlısoy's excellent vocals played a great part in this success. Additionally this album contained the very first bits of traditional Turkish music in Mezarkabul songs (No One Wins the Fight). Five years after Trail Blazer had been released, in 1997, the band released another album called "Anatolia" which was, for many, the climax of the band's musical career. In Anatolia, the anatolian/turkish sound took so vast a place in the music that the band would be almost associated with this sound. The band also covered a "türkü" (turkish folk song) called "Gündüz Gece" by Aşık Veysel. With this album Ogün Sanlısoy was replaced by Murat İlkan who had a unique and metal-friendly vocal technique. After the release of Anatolia in 1998, the band recorded a gig performed in İstanbul and released a live album called "Popçular Dışarı" which also contained a cover of "Black Magic" of Slayer. In 2001, the band released two great albums called "Unspoken" which consisted of Mezarkabul songs with English lyrics, and "Bir" containing songs with Turkish lyrics. Demir Demirkan was replaced by the lead guitarist Metin Türkcan with this album. Recorded and mastered in Sierra Studios in Greece, "Unspoken" was a masterpiece full of anatolian tunes and philosophical lyrics. Prepared especially for the Turkish audience, "Bir" contained two more "türkü" covers which are "Şeytan Bunun Neresinde" by Aşık Dertli and "Bu Alemi Gören Sensin" by Aşık Veysel. The band caught so much attention with the excellent "Unspoken" that they performed in Wacken Open Air, Germany in 2002. Pentagram is considered to be the greatest band in Turkey to combine the traditional elements of Turkish music into the metal genre creating a distinctive sound which other bands would follow in the future for years to come. 3) Pentagram also is a Death Metal band from Chile, which was active in the mid/late eighties. Possessed is clearly one of their main influences, along with Sodom, Master, Sepultura and other Metal bands from South America. Still they maintain their own brand of Metal, probably the rawest out of the South American scene. After two demos and one single in 1987 the band disbanded, mainly because no label wanted to sign them. Thirteen years later their demos were again made accessible by Picoroco Records. The band reunited in 2001 to play one final gig, which also was recorded and released as a live album under the name "Reborn 2001"
4) Pentagram is also an electronica-rock fusion band from Mumbai, India. The band has been active for quite some time and has released two albums. The latter, Up! was a seminal electronica album in the scene. They are working on a new album due for a release early this year. THe Band consist of Randolph, Shiraz, Papal and Vishal. They came together in 1994, with a strong need to play individual, original, unique music. This was as much a reaction to the stagnating Indian Rock scene, populated by bands playing mostly cover music, as it was a primal instinct. They did the rounds of college festivals, almost immediately becoming well known and popular, by winning three major rock competitions at the Kanpur, Delhi and Bombay IIT's. They signed a record deal and put out their first album ('We Are Not Listening') in 1996. It was listed by Rhythm House (India's premier record store) as the fastest selling rock album. They released two videos ("The Ignorant 1" and "Yoo") which were frequently played by all the music channels. Pentagram were MTV India's 'Artist of the Month' in 1997. They also won the Channel [V] awards for Best Live Band and Best Indian Band in 1997 & 1998. They were featured on Channel [V]'s Big Gig show, a showcase of an hour-long live performance. They played gigs in the Seychelles and all across Indian Campuses, while figuring out their sound When they put out their second album ('Up', 2002), their audiences were taken by surprise. The alternative rock band they had known had added a huge electronic edge to their sound. Pentagram have always maintained that the new sound came out of a burning need to find a way to make music that was uniquely and solely theirs. During the Kargil war, Pentagram recorded and released India's first exclusive-to-internet song, 'The Price of Bullets', which featured famous poet Javed Akhtar and popular Indian Classical artist Shankar Mahadevan. The video, directed by Farhan Akhtar, one of India's most successful young film-makers, was blacked out by channels across the board for being "too politically loaded". It was added as a bonus track on their second album 'Up'. They became the first Indian Band to top Asian mp3.com charts with six songs going to No. 1 for over two weeks each. ("Drive", "Strange", "Think of Me", "Don't Care", "Is there a Light? ", "The Price of Bullets" all featured on 'Up'). Their single, "Think of Me", went to no. 5 in the world on Billboard's talent hunt site. 'Up' was later released and published by their self owned music label, 'Pentagrammusic', produced and distributed by Sony Music (India). It went on to become one of India's highest selling rock albums with more then 15,000 copies sold. A string of awards followed including Best Live Act at the June Rock Out awards in 2003, winning the readers poll for 'Best Indian Band' by Rock Street Journal twice. Their new edge brought them international recognition, in that the doors of several festivals were flung open to them. They headlined the Sundance Music Festival in Estonia in 2003, a first for any Indian band. They were also invited to, and played at the Glastonbury Music Festival in 2005. This was a real high point, as they not only became the first Indian Act to play there, but also became aware of the real possibilities of their music. They were able to share the stage with contemporary giants like Coldplay, Chemical Brothers, Tori Amos, Fat Boy Slim, White Stripes. Seeing how they stood up to huge acts, and how positive the audiences were, knee-jerked Pentagram into producing their current album. 'It's OK, It's All Good', released by Counter Culture Records in March 2007, has been very well received. The first single off this album, "Voice", won the Song Of The Year at the recent Jack Daniel's Annual Indian Rock Awards the same night Vishal was awarded Vocalist Of The Year. Self assured, more mature, and yet, as edgy as ever, they hope to release this latest effort internationally, as well as tour the festival circuit far more aggressively.